Portrait of Native American author N. Scott Momaday told through his words, his art and the words of his friends and admirers including Joy Harjo, Robert Redford, and Jeff and Beau Bridges. Solid American Masters film will open your eyes to a great literary and cultural voice. Personally I had never run across Momaday prior to seeing the film so I had no idea what I was getting myself into. The man himself is a real charmer. Blessed with a storyteller way for words and voice you'll want to listen to all day this is a film that isn't something you'll think of informative but as simply a great story. Along the way we see Momaday's influences on popular culture and how me connected the Native American stories of life with the present day. For anyone not Native American his winning of the Pulitzer Prize sudden brought an entire culture to life. Momaday's words opened up possibilities that had never seen before. While Momaday's words and person make this a must see, I wish the presentation had been a little bit more special. Yes, this is my own foibles, but I wish this hadn't felt like a typical American Masters film. 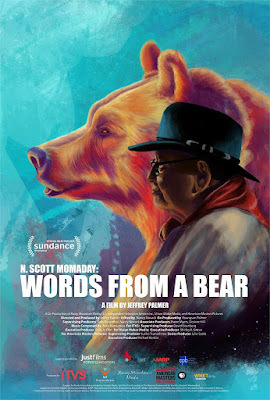 Regardless of my nitpicking N. SCOTT MOMADAY: WORDS FROM A BEAR is a must see, more so if you're like me an never encountered the man before.